Twelve. That’s right. What does it mean to you? In this case, I’m referring to a group exhibition I will be participating in later this year during, yes, the twelfth month. 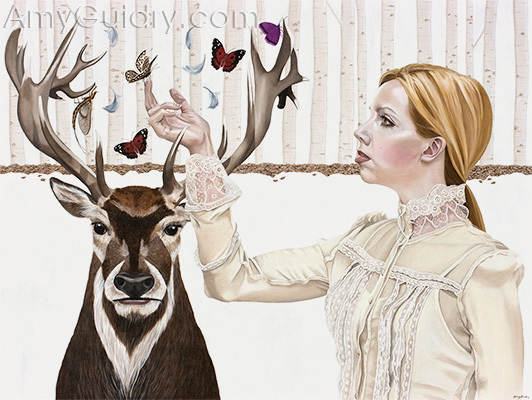 The show is titled “Twelve” and is slated to open December 6th at Wally Workman Gallery in Austin, Texas. In keeping with the theme, twelve artists have been asked to participate. I was one of them, so I’m thrilled and honored to be included. Each artist will have a piece pertaining to the number or, perhaps, concept of 12. I won’t spoil the surprise so you will just have to wait to see my painting! I will say this. It’s a large piece. That’s all for now. 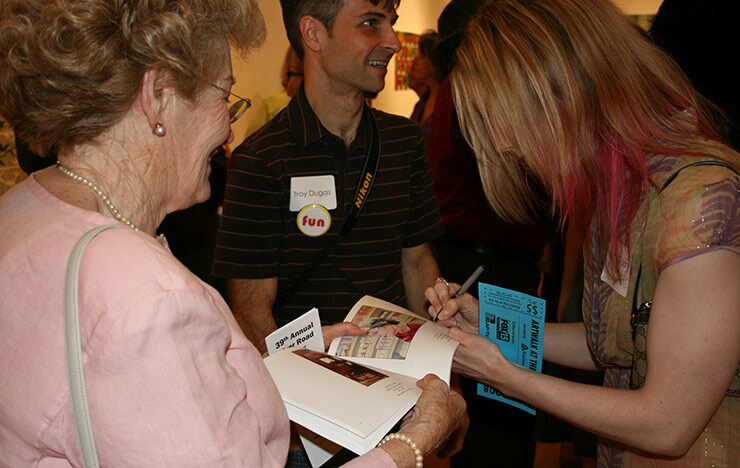 And I am excited that it will be among other artists whose work I admire greatly. I don’t want to spoil that either. You can see what I’m talking about if you check out their website at www.WallyWorkmanGallery.com. Some of my favorites are Erin Cone and Ali Cavanaugh. Sold- “Stag” painting by Amy Guidry. From the New Realm series. To view more work from the series and the entire portfolio, and inquire about availability, visit www.AmyGuidry.com. 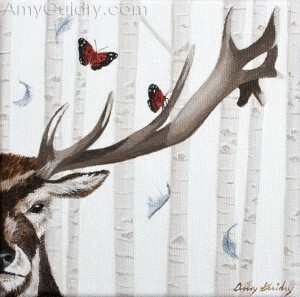 "Wisdom" by Amy Guidry; Copyright Amy Guidry 2008. Well, not quite. But it will be soon. My solo exhibition at Henri & Odette in Las Vegas, NV will be ending on October 22nd. This means you have about a week to get your booty over there if you haven’t already. If you’ve ever wondered what my work looks like in person, this is your opportunity. I can’t stress enough how the web, despite its greatness, just doesn’t do artwork justice. Not mine, not anybody’s. Just as thumbing through an art history book is not the same as going to an art museum, neither is perusing the internet. You can stare at those pixels all you want, it’s just not the same. And there’s no gallery ambience to go with it, either. 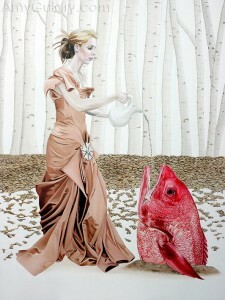 You can view my show, New Realm, at Henri & Odette. It’s located on Carson Avenue between Las Vegas Boulevard and Sixth Street. In Las Vegas, of course. And if you’d like to see more of my work, go to www.AmyGuidry.com. While you’re there, you should sign up for my newsletter (see contact page) to get the latest details on my upcoming shows, new work, etc. No, I’m not referring to any movies… I have a solo exhibit coming up next year. This is the first ground-breaking news regarding this exhibit, so consider yourself special. My New Realm series will make its way to the Schepis Museum in Columbia, Louisiana in 2009. I don’t have all the details just yet, but the show is slated for March and April of 2009. So, yes, this will be a two-month exhibit as opposed to the usual month long ones of most places. Guaranteed there will be new work and some you may already be familiar with in the show. If you don’t know by now, you can view my work on my website at www.AmyGuidry.com. As for the opening reception and show dates, I will have those details at a later date. Until then, I recommend you A) Sign up for my newsletter via the contact page of my website and B) Keep your eye out for details on this blog. And because I love getting mail (hint, hint), you can always email me, write me, or even call (!) for details regarding my upcoming shows, new work, etc. You know where to reach me- go to my contact page at www.AmyGuidry.com. Well, I received a copy a little late, but my New Realm series received mention in Art Business News magazine. The August issue featured photos and a blurb about my work featured at the Zigler Art Museum in Jennings, LA. The show has come and gone, but it’s nice to know it’s still getting some exposure. One of the photos features me with Troy Broussard, PR rep for the museum. 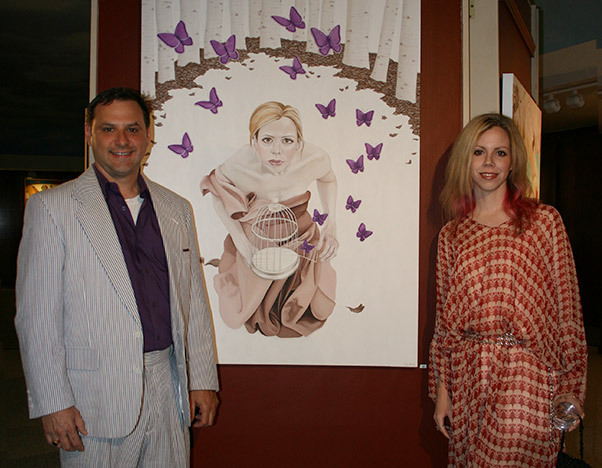 The painting featured is “Release.” The other published photo is an installation shot of my work in the museum. To see more of my work, in addition to the entire New Realm series, go to my website at www.AmyGuidry.com. 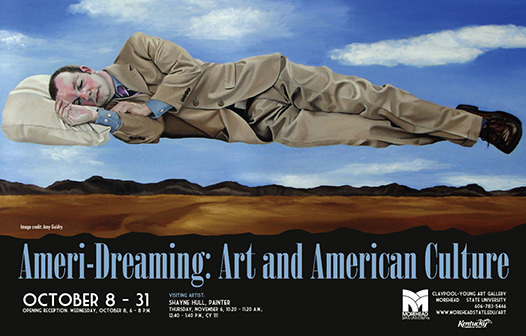 I was recently selected to show my work in an upcoming exhibit, “Ameri-Dreaming: Art and American Culture.” I was thrilled because aside from being another opportunity to get my work out in the public eye, this is also a chance to show my social commentary paintings. Three works will be in the show at the Claypool-Young Art Gallery, which is a university art gallery at Morehead State University in Morehead, KY. If you are in Kentucky, or will be there soon, be sure to check out the show. 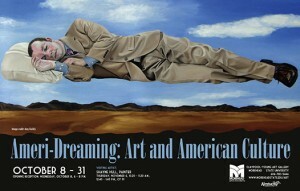 The opening is October 8th from 6-8pm, and the exhibit will run through October 31st. 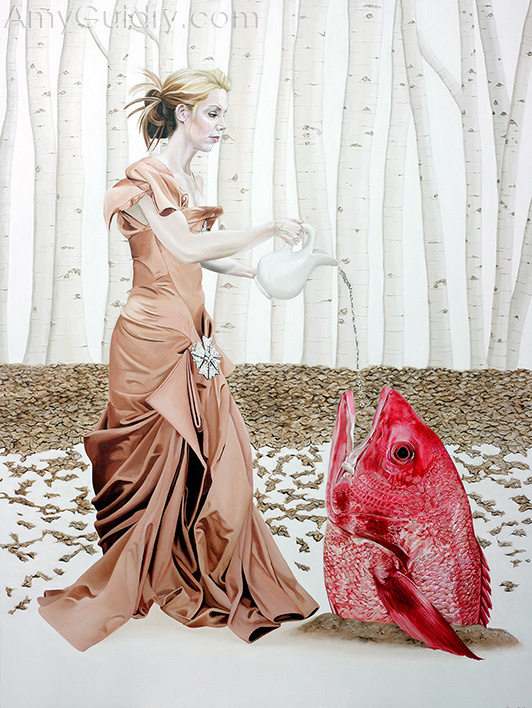 Other artists in the show include Margarita Benitez, Steve Coy, Marianne Fourie, Shayne Hull, John Judge, Lisa Link, Joshu Lucas, Matthew Mosher, Michael Runnels, Halide Salam, Steve Snell, Sarah Sorg, Mangi Weir, and Dan Younger.